Just got around to finishing this one, was quite worth it. -Almost all of the characters are constantly smiling, but it never feels forced or stupid. They come across well as smiling for authentic reasons, with authentic feeling. Impressive for so short a show. -Only 12 episodes long, perhaps too short for some people to consider worth the time. My Opinion: I actually feel like it was better to seat this one in a corner, and then pick it up later when I could finish it all in one sitting. The episode methodology actually harms this show a bit, its a short anime with only 12 episodes, and nevertheless it still takes about 5 episodes for it to wind up into its quality stuff. I still loved it, it is a great example of simplicity executed with depth. Nothing ever needs to be frivolously shallow, and this is a good example of that. Nothing particularly complex ever happens in the show, despite how much could be explained in complex ways, or actually is complex(Why do phantoms explode into that weird 3D Japanese character bomb? They never really explained, but it does look nice). Things could have very easily been made more complicated, but they didn't make it so, and it doesn't become a shallow show for staying simple. I definately liked this show as a whole, and I'm interested in where it continues after the anime, which the anime actually drops a seed for, with Nora's last lines, in addition to some other elements I shall not mention, because spoilers. I recall seeing a Manga by the same name back when this first started airing, I think I'll go pick that up. Impartial Judgement: Simple. I consider that a good thing in the context that it didn't sacrifice depth of characters, emotions, or reasoning to achieve it, but I know there are people who just are not interested in shows that are too simple, and I've heard their reasoning and found it to be sound. Noragami is short, but it has strong Human Interest elements. Characters will often do spontaneous tangent things, like mood swings, but it never feels like they're doing it just for the sake of doing it, like other shows have similarly suffered from in the past, when doing something like it. From other shows, I felt more like it was....mm, shock value, I suppose is the closest term. It felt like the characters were doing it for the sake of an interesting show, rather than it just being an interesting character doing something interesting. 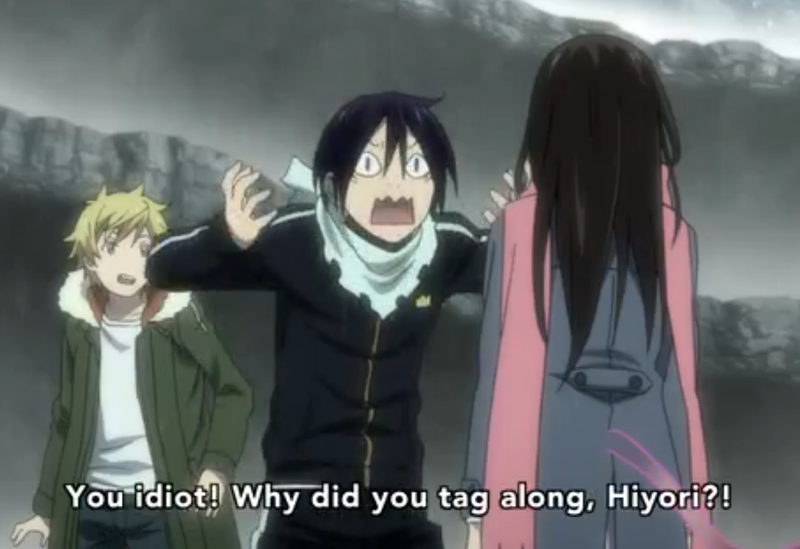 Still, Noragami's characters are not especially deep. Well built, well reasoned, yes, but not complex enough to deeply love. I liked the show, but I have no delusions that I will have forgotten it a month from now, if not within the week. If you've seen the show, you'll find that sardonically amusing, given one of the shows plot elements. I still fell good about the show, and I do recommend it, but reason tempers me to not go vomiting enthusiasm on people about it, because they will then be underwhelmed. In particular, I feel like the show left a lot unsaid and undone with Hiyori, the female lead for all intents and purposes. In the face of other characters who got a lot more interesting, even in the shows short episode count, she never really developed as much. She didn't particularly need to, she developed enough certainly, but it contributed to the shows primary weakness of being underwhelming at the end of the day. I soundly Recommend this show, with a touch of underwhelming warning.